I spent the weekend playing with my Now That's a Jig! which was developed by the amazing Brenda Schweder. For those of you who don't know, this wonderful tool allows you to easily wrangle wire into and around shaped pegs of all styles. Here's a picture of the NTaJ! set-up to create a neckwire. 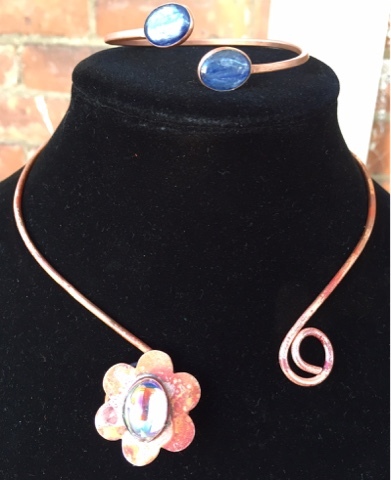 I use this configuration as the basis for a soldered bezel necklace I'm teaching this fall. This weekend I was making my version of Brenda's Kinetic Links necklace (see pic further down). I learned about this pattern on one of Brenda's Facebook live shows. Brenda is generous with her time and sharing her knowledge. If you "like" her FB pages Brenda Schweder Jewelry or Now That's a Jig!, you can sign up to be notified about her broadcasts live at noon Central time (1:00 pm for those of us in Toronto) on Mondays and Thursdays. She recently added a live broadcast from her work bench on Tuesdays at noon Central where you'll get great insight into her design process. There are monthly challenges you can enter and the prize is a gift certificate for Brenda's store. 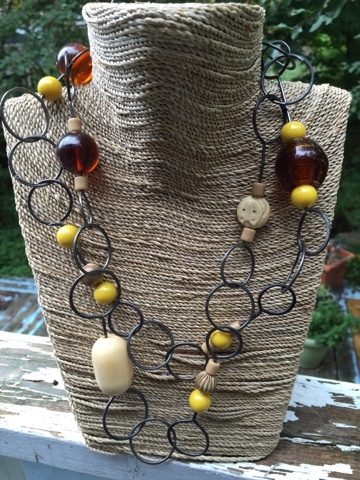 Here's my entry in the August challenge Chain Link Love. This month's challenge is squares. Last week Brenda demoed "scrappy soldering" on steel wire. During her live broadcasts, she answers questions in real time and there's lots of fun and info to be gleaned in the growing community she is developing online. You can watch the videos after the fact too. So catch up on everything you've missed over the last 50+ broadcasts. Here's my version of Kinetic Links. If you want to experiment with the NTaJ! 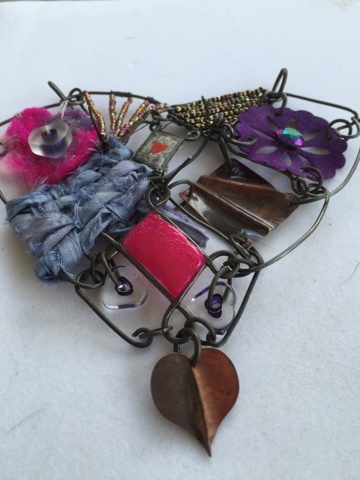 before investing you can always arrange for studio time at Beadfx to use theirs or join me on Open Metal Studio night Friday, September 30 for a crash course in how to set up and design using the jig. 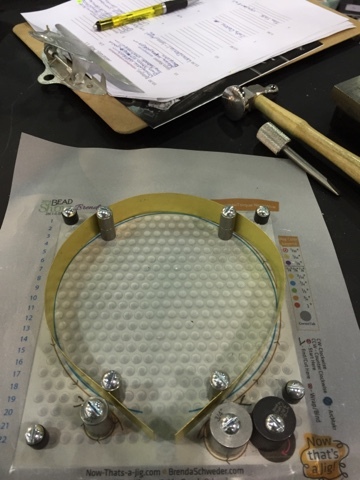 There are so many cool ways to use the jig to enhance and professionalize your jewellery designs. Love your new necklace! Where's a photo of your beautiful Cathedral Windows piece?